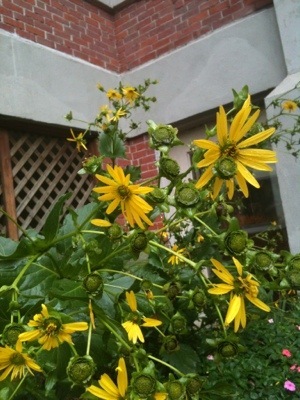 Imagine my delight at finding Cup Plant (Silphium perfoliatum) just outside my grandparent’s window at the garden by their home in Greenfield, MA on a recent visit. 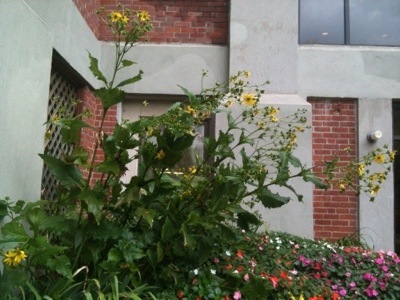 They live in an apartment building with a courtyard and that’s where this native plant that attracts birds is found. In a recent blogpost we elaborated, at length about all the extraordinary habitat features of Cup Plant in ecological gardening. 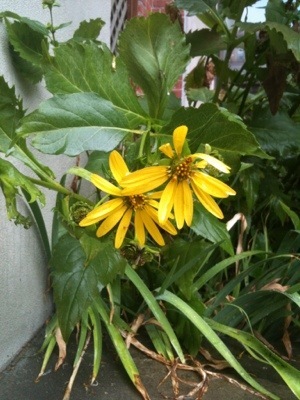 Since Cup Plant is in bloom right now, it is lighting up habitat gardens and rain gardens all over the North Eastern US, like bite-sized pieces of sunshine.